Joe Raedle/Getty Images(WASHINGTON) -- A massive tent camp in Texas that at one point housed some 2,800 migrant teenagers who had crossed the U.S.-Mexico border alone will close, the Trump administration announced Friday. The Tornillo facility in Texas had become a lightning rod in the immigration debate. 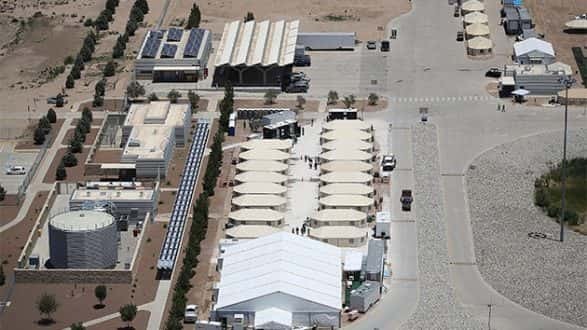 The tent camp ballooned as U.S. officials reported an influx of older children and teenagers arriving at the border without parents. HHS took custody of the "unaccompanied minors," and relied on privately run shelters like Tornillo scattered across the country to care for the teens. “Warehousing thousands of children in tents for weeks and months on end has been one of the most disastrous policies of the Trump administration responding to children and families seeking safety at the border," said Margaret Huang, executive director of Amnesty International USA. Administration officials say they have had little choice but to house teens in facilities like Tornillo because the kids weren't in the country legally and releasing them to sponsors without stringent background checks could have put them at additional risk. Her statement, however, suggested that other facilities like Tornillo aren't going away and could be used again if there's continued influx of asylum claims at the southern border.